London is a living history book. Everywhere you turn you’ll find impressive sights, the ghosts of larger-than-life historical figures and a dash of pomp and circumstance sprinkled throughout. And on top of all the familiar facets we learned about in school is a modern city that is constantly evolving. 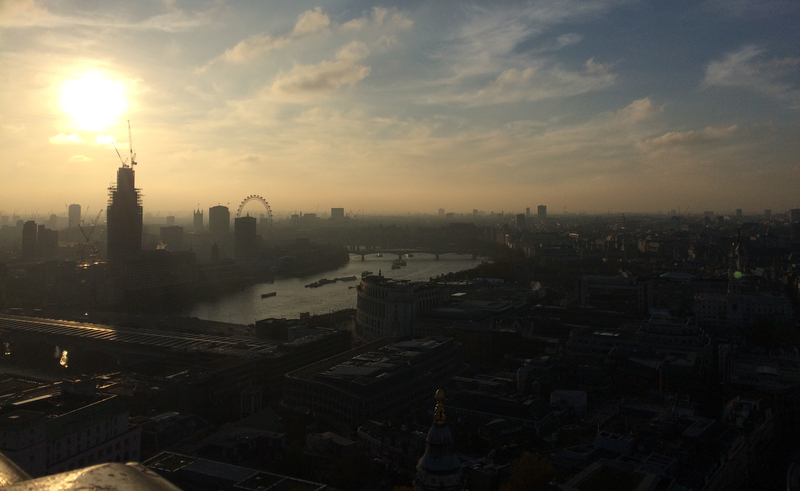 After arriving in London this past November for our first visit, we were greeted by surprisingly favorable weather so hit the ground running. 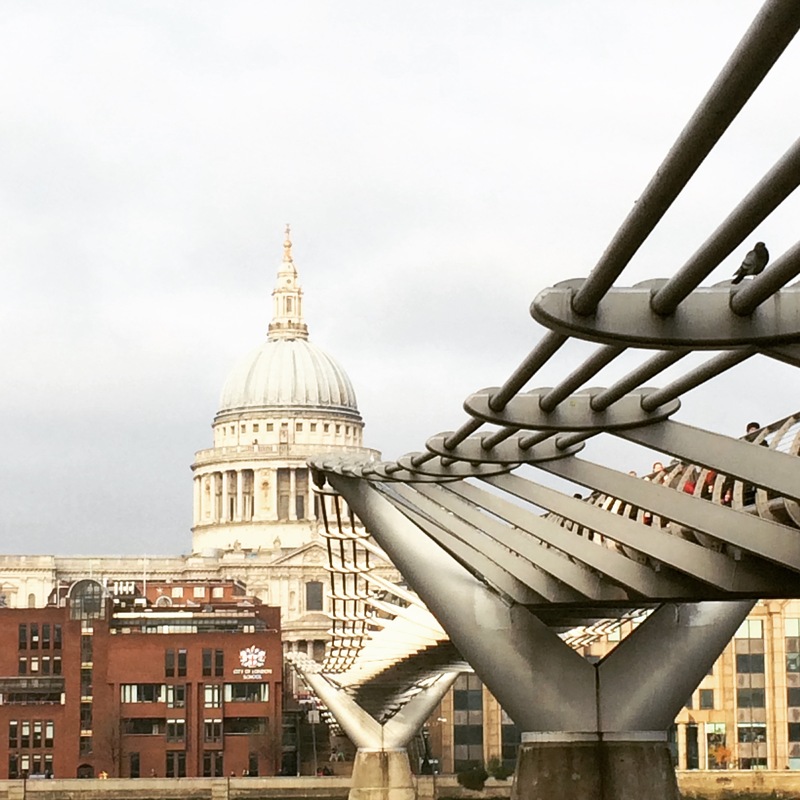 Heavy on sights, this walking tour traces its path along the Thames River and is a great way to orient yourself for a first taste of this exciting city. Our morning started at Buckingham Palace, which has been the official residence of the monarchy since 1837 when Queen Victoria moved in. Built in 1703, it was originally the private home for the Duke of Buckingham, and was later bought by King George III in 1761 as a family home close to Saint James Palace. After several additions over the years, today’s palace includes 775 rooms that span 77,000 square meters (nearly 83,000 square feet), employing more than 800 staff members – including 2 horologists whose job is to keep the palace’s 350-plus clocks in tick-tock condition. Look for the Royal Standard Flag flying above Buckingham Palace denoting that the Queen is at home, otherwise you’ll see a Union Flag (like we did). 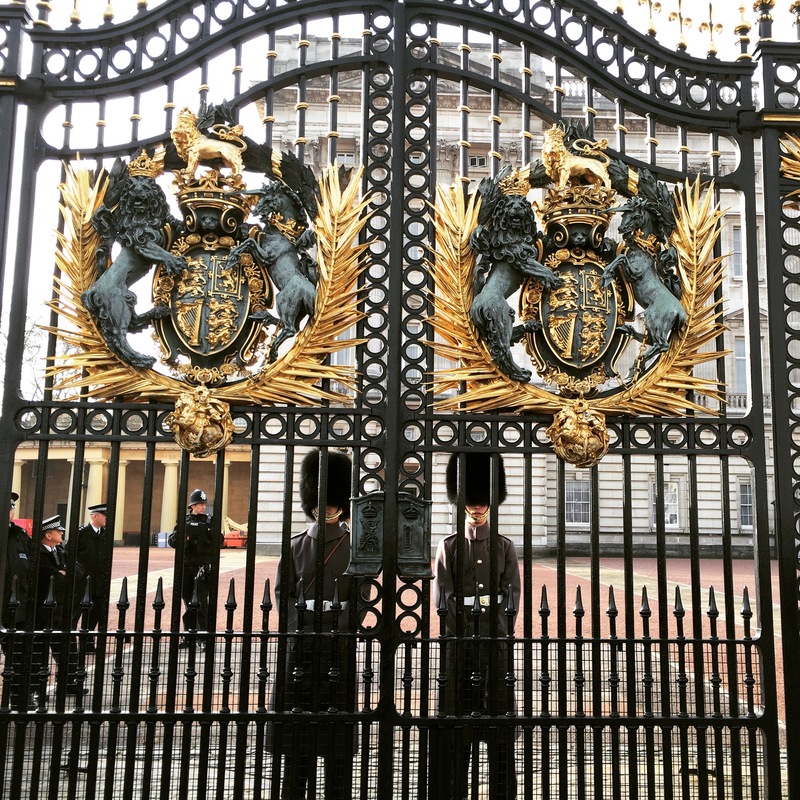 We just so happened to visit the palace during the Changing of the Guard. Immersing ourselves in the fanfare and sea of anxious onlookers, we arrived just in time see the current palace Guard relieved of their duties as the new Guard marched in from the Wellington Barracks. The ceremony attracts a HUGE crowd, which makes for one of those things you have to experience once in your life, but if you would rather avoid the chaos just adjust your visit time accordingly. The official start time is 11:30 am, and the entire ceremony spans roughly 11:00 am to 12:00 pm (daily from April to July and on alternate days the rest of the year). After leaving Buckingham Palace we headed down the Birdcage Walk to Westminster Abbey. The gorgeous Gothic church has played host to royal coronations and weddings since 1066, including the 2011 nuptials of Will and Kate, which was watched by more than 2 billion people around the world. 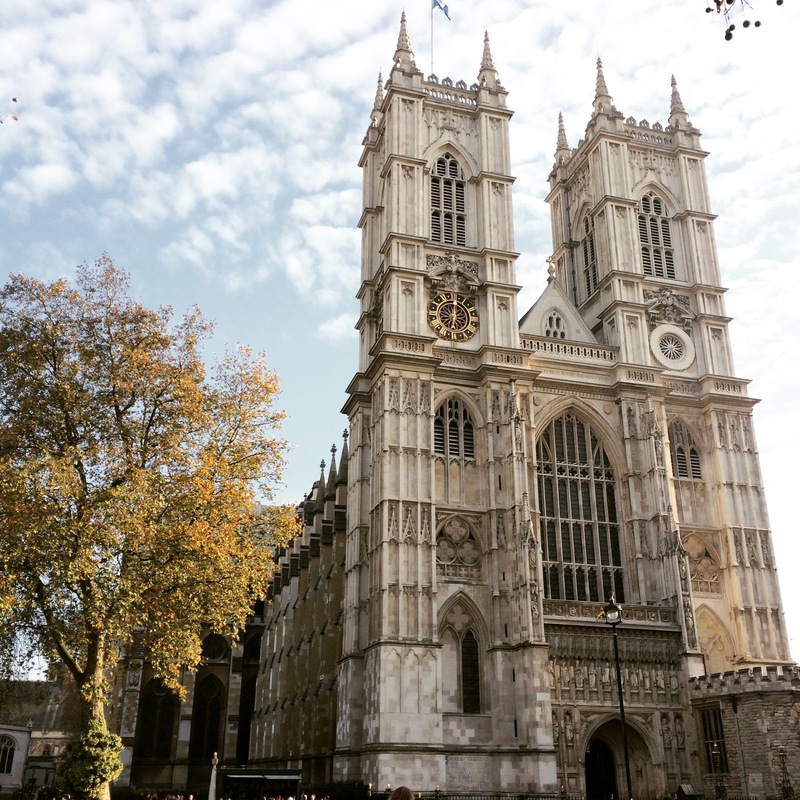 Westminster Abbey is also the final resting place for more than 3,000 notables ranging from Elizabeth I and Mary I (both daughters of King Henry VIII) to Canterbury Tales author Geoffrey Chaucer. A tour through the church is like a comprehensive lesson on who’s who in English history, well worth the steep admission price. I also enjoyed walking through the beautiful choir, as well as reading the plaques that memorialize some of England’s greatest writers in the Poets’ Corner. Exiting the church our next destination was the House of Parliament, one-time royal residence turned government meeting place for the House of Lords and House of Commons, to snap some photos of the iconic Big Ben. 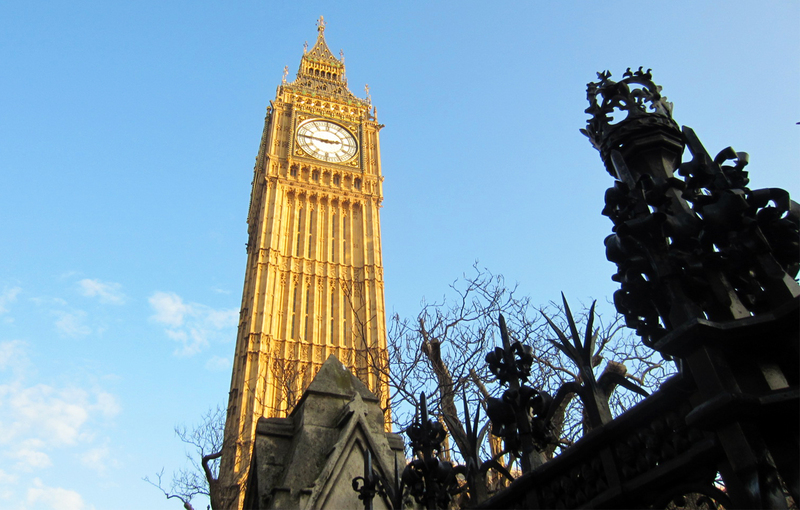 Unbeknownst to many, the name actually refers to the tower’s massive 13-ton bell, not the tower itself with its equally impressive 23-foot clock, the largest four-faced chiming clock in the world. From here we crossed the Thames via the Westminster Bridge for another photo op: the London Eye (remember I told you this walk was heavy on the sights!). The giant observation wheel is actually a recent addition to London’s skyline, built for the Millennium in 2000. We continued along the river’s South Bank to take in even more sights, stopping at Shakespeare’s Globe. The theatre you see today only opened in 1997 and is a best-guess reconstruction of the Elizabethan-era “wooden O” theatre that once stood nearby (look for the sign denoting the original Globe Theatre’s foundation line). An interesting fact is that the original Globe was only in operation for 14 years, from 1599 until it was destroyed in a fire during a performance of Henry VIII in 1613. Backtracking slightly, we headed towards the Millennium Bridge, which offers a pretty killer approach to St. Paul’s Cathedral – its elegant dome framed by the swooping metal of the pedestrian bridge. If Paris had Haussmann, then London had architect Sir Christopher Wren who was responsible for rebuilding more than 50 churches in London after the Great Fire of 1666. Completed during his lifetime in 1710, St. Paul’s was his most notable project and remains one of the most important buildings England today. Although it bears another pricy admission fee, your ticket includes entry to the church (the site of important weddings such as Prince Charles and Princess Diana in 1981 and funerals including Prime Ministers Winston Churchill and Margaret Thatcher), the crypt (where Wren is buried) and the 365-foot dome. Do not skip the latter – it’s one of those climbs that rewards you with a beautiful unobstructed view of the city. When we reached the top, the light was just right as the winter sun was starting to dip down towards the horizon, basking the skyline in an almost ethereal glow. For the last part of our day, we pushed on to the Tower of London. 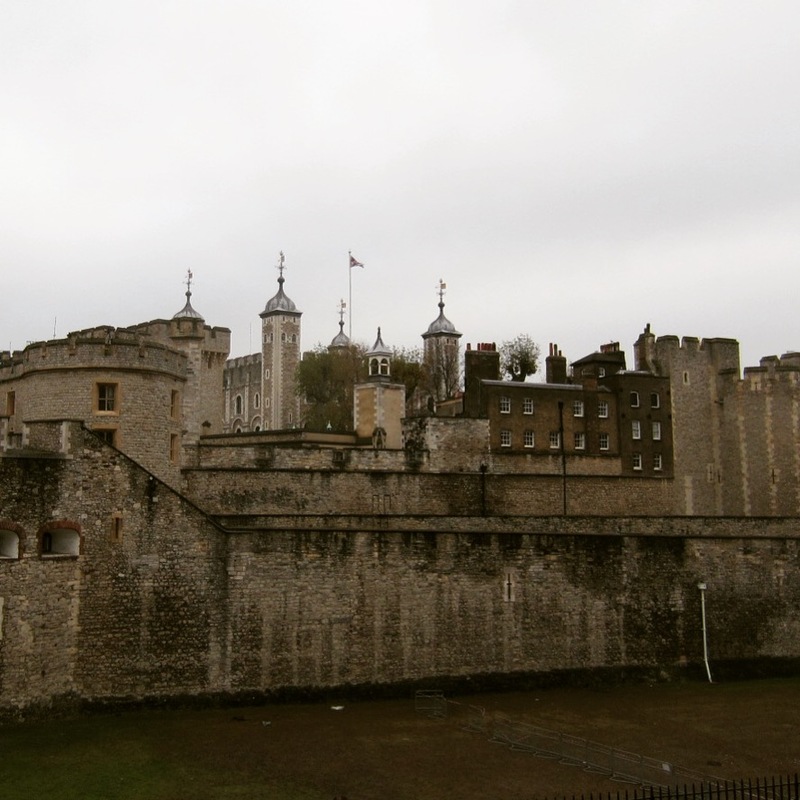 The 11th century building has a multi-layered past as a heavily-fortified royal residence that later became a grim prison in the 16th and 17th centuries, and today the keeper of the Crown Jewels and one of the most visited attractions in London. Walking around the perimeter made me recall all of the references to the Tower in books I’ve read over the years (The Daughter of Time, The Other Boleyn Girl, etc.). A little jetlagged and weary of the long line, we regretfully skipped going inside, but I would put it towards the top of our list for another visit. As we rounded the back of the Tower, we paused to take in one last sight, the Victorian-era Tower Bridge, and reflected on a day well spent. If all goes well I will be doing a walking tour and will hit most of the sights you have shown us above. You did much in the short time you had and it seems like the weather cooperated. I am hoping for decent weather when I go as last time I was there I was a child and my memories consist of the rain and cold that seep into your bones – as you can see not happy memories. I am ready for those to be replaced with great times with my family. Yes! Fingers crossed that you have good weather!